A kid who knows Judo! Judo means "the gentle way" and this form of martial art which originated in Japan incorporates throwing techniques with certain core values. It will be of interest for parents who are looking for well rounded kids? activities! Kids during a Judo training. Would you like your kids to take part in kids’ activities that can improve their self -confidence, aid their moral development and help them get fit at the same time? You might want to consider judo. Judo usually takes place on a mat or ‘tatami’, so it is fairly minimal impact and could suit kids who are a bit more timid and reluctant to fall. So why enrol your kids in judo? Kids can start judo from as early as 3 or 4 but many schools start formal judo training at around 6 years old. A lot depends on the individual child and their level of maturity, so it is worth having a chat to the instructors at your chosen school before enrolling your child in any classes. Concerned about injuries? As with most martial arts, one of the first things children learn at judo is how to roll and fall in a way that is designed to reduce the risk of injury. It’s a valuable skill to have - once it becomes a habit it could come in handy in a range of situations! How can you organise judo lessons and matches for your kids? Judo activities for kids can be found at judo clubs which are located around the country. 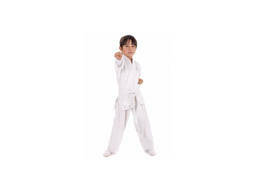 Judo lessons run on a per term basis and generally cost around R200-R300 per term. Through a judo academy, kids can work up from basic sparring techniques to different levels of belts and competitions which can give them a great sense of achievement and help increase their self -confidence. All mats and safety equipment are usually provided by the judo school, but parents will need to purchase uniforms for their kids to wear while training and competing. Judo activities for kids can be great fun, and a wonderful outlet for any excess tension and energy!